In 1936 H.P. Lovecraft published ‘The Haunter Of The Dark’, his last known work before his death the following year. 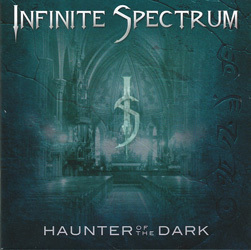 Eighty years later, for their second album Infinite Spectrum have taken Lovecraft’s story as the basis of their album of (almost) the same name, turning the short, shocking story of the horror that lives in the dark and inhabits an abandoned church into a sprawling 71 minute concept album. It’s a mammoth task, but Will Severin (vocals), Alex Raykin (guitar) Katie Pachnos (keyboards), Alex Repetti (bass) and Greg Schwab (drums) have certainly risen to the challenge of turning Lovecraft’s nightmare into a musical reality. They’ve captured the repulsion of the original story lyrically, and the music creates the perfect atmosphere, perhaps no more so than on the slower ‘The Stranger Things I’ve Learned’; the haunting realisation that things have spiralled out of control is perfectly portrayed on what is actually the shortest song on the album. Exciting, talented, and unashamed to proclaim their progressive metal influences, the New York City-based band – if you want a point of reference – are probably closest to Symphony X, in particular when they really let go as in the manic title track, with its frenetic guitar and keyboard passages, and the (relatively) short, sharp shock of following cut ‘Fear’; and those who favour the style Dream Theater achieve when they let loose will savour ‘2:12 AM’. But there’s much more here than simply the sum of the musicians’ inspirations, as they’re quite happy to go off in their own direction. They perhaps play their ace card too soon with the eighteen-plus minute epic ‘The Church’ coming very early in the running order, but of course the needs of the story dictate that way the music must play its part and there’s plenty of light and shade running through the second half of the album to keep the momentum. None of the players are slouches, but Raykin’s solos certainly demand attention, and it’s also a joy when Pachnos is allowed to rise above the soundscape and have her time in the spotlight. With just one previous album (2013’s ‘Misguided’) to their name, Infinite Spectrum aren’t really that well known on the progressive metal scene at this point in time, but ‘Haunter Of The Dark’ should rectify that.